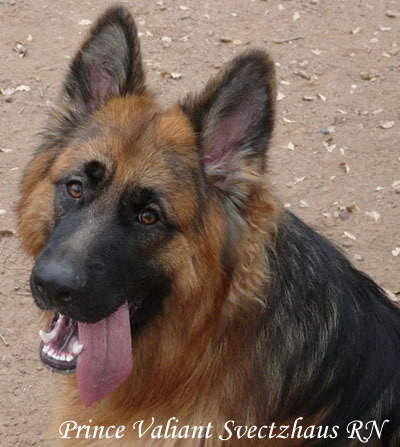 German Shepherd Long Coats and Long haired dogs. So I thought naming our website GSDcoats.com would be appropriate since we do have a majority of plush and long coated German Shepherd dogs and puppies. 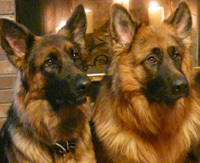 German Shepherds have 2 coats, an outer and under coat. The true long hairs do not have the under coat. So their outer coat seems very silky and smooth looking because it does not have the body of the under coat to deal with. if a puppy blows his puppy coat (usually about 14 to 16 weeks old.) and has tufts of hair in his ears or between his toes, you can be fairly certain the dog will end up being a coated dog. There is no correlation between a coat and a dogs working ability, although in Europe you will see a lot of police service dogs are coated dogs. The important distinction between the correct and incorrect coats (per the German Shepherd standard) is not just hair length, but the pattern of hair growth. The incorrect coats have the bushy tufts behind the ears, the big fluffy pantaloons and big bushy round tail, and long fringes along the backs of the legs, and longer hair between the toes. Often, owners wonder why the coated German Shepherd is considered a fault. It has been thought that this was due to the fact that long hair German Shepherds sometimes lack the undercoat of a normal coated GSD. The undercoat was beneficial in helping the GSD withstand the elements during sheep herding in Germany's climate. A dog that is a long stock hairdoes have an undercoat. However, a true long coat (soft and silky like a Flat Coated Retriever) does not have an undercoat and has always been a disqualification. Our Gsd coats are long, plush and standard yet they all need love and excersize but like everything else It needs to be in balance. Do not do any type of agility programs with your puppy until at least one yr. of age, and at this point it should only be an introduction for going into the second year, a German Shepherd puppy is still not fully mature. The repetition of agility is stressful on maturing joints "hips". Their bones are not completely calcified until two yrs. of age.! Please keep this in mind. A one yr. old pup may look like a mature dog, but are very much still a pup.